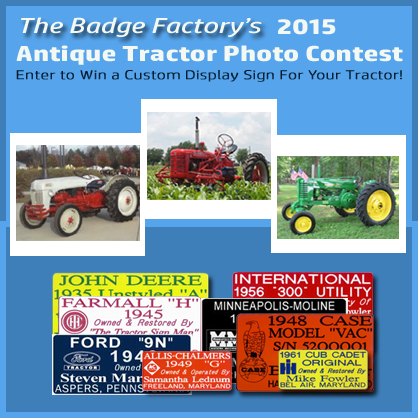 Enter to Win Our 2015 Antique Tractor Photo Contest! Step 1 – Like & Follow Us on Facebook. Step 2 – Enter a photo of your favorite antique tractor in the comment area beneath the contest poster image on our Facebook page, along with the tractor year, make, and model. The tractor must be 1980 or older!! Step 3 – Invite all of your Facebook friends to vote for your antique tractor, by “liking” your photo/comment. Step 4 – Check our Facebook page regularly to see how many people are voting for you! Deadline to enter is Friday, November 20, 2015 at 11:59 p.m. EST! Last day to vote is November 23, 2015. After we review all the votes, the winners will be announced on Wednesday, November 25, 2015. First through Third Place Winners receive a Custom Engraved Magnetic 5″ x 8″ Tractor Display Sign. Fourth and Fifth Place Winners will receive a Custom Engraved Magnetic 3″ x 6″ Tractor Display Sign. Rules/Disclaimer: This promotion is open to those 18 and above in the United States. Void where prohibited. By participating, you are entering and agree to the terms that this promotion is in no way associated with, administered by, or endorsed by Facebook; and acknowledge a complete release of Facebook by your participation. You also acknowledge you own and have full rights to use this photo, as well as give us permission to use it in future advertising campaigns.